Uncategories Time to resurrect the Shift-F9 button? Time to resurrect the Shift-F9 button? Back in his original stint as this site's author, Macro Man used to muse about writing a macro to auto-blog when the same themes cropped up day after day, which he could then activate with the trusty Shift-F9 buttons on his keyboard. In contrast to the 2008 era, however, today's Shift-F9 post would simply read "another new high in the SPX, eh?" 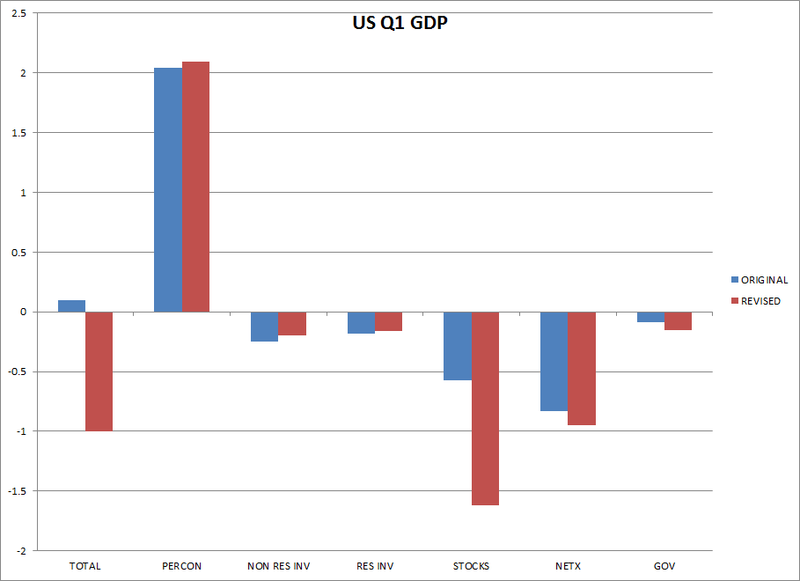 Markets correctly looked through the weak Q1 GDP revision, which was almost exclusively a function of weaker inventories, as shown in the chart below. Insofar as the inventory unwind will come to an end, markets are correct to expect a bounce in growth in the current quarter. Barring an uptick in capex and residential construction, however, it is difficult to see how the upbeat consensus for the remained of the year will be realized. However, as long as corporates can eke out a smidgeon of profit growth and the Fed maintains financial repression, it seems as if stock operators are happy to keep expanding the P/E multiple of the index. Well, perhaps "happy" is the wrong adjective here. As Merrill's Michael Hartnett noted in his latest missive, low risk levels and poor investor performance could be two catalysts for a melt-up over the summer, an outcome that would certainly be unwelcome to your author given his current positioning. How about the rest of the market? Macro Man performed a little study using the HFR strategy indices, which are flawed in many ways but at least provide high frequency updated. He compared the SPX total return and vol to that of a variety of different hedge fund flavours; the results are set out in the table below. The volatility figures of the HFR indices look unrealistically low, which is an obvious warning to question their construction. However, we can control for this in part by simply looking at the return to risk ratio of each sub-index and comparing it with that of the SPX total return index. What do we find? Market neutral and event-driven strategies are beating the SPX, while merger arb comes close. Macro and what your author assumes is 130/30 are scuffling mightily, however. This is nevertheless a bit of a turnaround from last year, however, when most equity strategies more or less kept pace with the SPX (with the exception of market-neutral.) If you wanted some evidence of the pain wrought by some of the rotation unwinds this year, the 2014 section of the table above is it. While the negative performance for macro this year is certainly believable, Macro Man is fairly dubious that the street as a whole lost money in macro last year; almost all of the funds that Macro Man follows were up between low single digit and mid-teens percentages in 2013, depending on how much of an equity bias they tend to have. As such, he is not really prepared to take the data for less familiar sectors completely at face value. What is fairly evident, however, is that performance is much less robust than last year virtually across the board. That fund vol is apparently higher than last year despite largely unchanged vol in the SPX might call into question the thesis that positioning is light; of course, it could also represent the ruptures caused by the sector rotations of April that were subsequently exited and never re-entered. Of course, Mr. Hartnett is also accounting for things like mutual fund cash levels which are much more important and accurate than reverse-engineering hedge fund positioning from flawed performance indices. The moral of the story, it appears, is that there is nothing here to disprove the notion that there's a risk of a melt-up. Well, that and the fact that Macro Man might need to learn something about event-driven investing (and directions towards a primer would be most welcome!) Although "Event-driven Man" doesn't have quite the same cachet as your author's current sobriquet, by the looks of it, it might do a rather decent job of paying the bills! "Macro Man might need to learn something about event-driven investing"
Try Joel Greenblatt's book on that topic. Bad title, good book. They dropped 9.8% from last quarter. Considering the link with S&P, it would be interestesting to see if it s only weather related or more. Regarding melt up risk, this rally is still misloved and the pain trade remains yields trading in range with stocks moving higher. Also considering the amount of QE that has been done around the world, it would be odd that the market doesn't overshoot on the upside So that's where we should be heading. Well, when you say is it time to press the Shift-F9 button over the summer, what your really saying is that certain Politicians are clicking into auto-pilot. What we should be taking notice of is of how desperate some Politicians are to remain in the spotlight when their use-by date has expired well beyond an interesting threshold. How sad it is. Could you please give a book title? You Can Be a Stock Market Genius: Uncover the Secret Hiding Places of Stock Market Profits. Told ya it was a bad title! It is really appreciable to work with such sweet and professional people. It is always a pleasure to work with them. Had company holiday party there and it was absolutely amazing! MM wants to try his hand at Event Driven investing? From my vantage, its pretty much the opposite of Macro. Event driven is all about the micro, companies, special situations (spinoffs, mergers, takeovers) and credit work outs. Interesting stuff but its all about the details.